Cardiff international airport dates back to the early 1940s when the Air Ministry set up wartime satellite aerodrome and training base for RAF Spitfire pilots. The airfield was officially inaugurated in 1942 and became a commercial operating base only in the early 1950s. In 1965, control of the Cardiff airport passed to the Glamorgan County Council. Transatlantic flights began to land in Cardiff international airport after the expansion of the runway as well as new Terminal Building and Control. New links were established between Cardiff in Wales and Canada. This later extended to Florida. The Manx Airlines made Cardiff airport their European Air Route Hub in the early 1990s. This led to increased flights within Europe and the UK. In 1992, Cardiff airport celebrated its 50 years of existence and a series of expansion projects were launched. These include redevelopment of landside forecourt area and expansion as well as modernization of the International Departures Lounge. The Airport Company was privatized in 1995 and Cardiff airport has been expanding since. The Cardiff airport in Wales handles nearly 1.9 million passengers a year. In 2003, it was the UK's second fastest growing airport. Cardiff International airport will see budget airlines such as Zoom airlines operating to Canada soon. There will be flights to Portugal from Cardiff Wales airport from the summer of 2005. There have been increased flights by bmibaby airlines - an award-winning airline that offers discount fares. Cardiff airport is situated in Rhoose, which is about 10 miles from the junction 33 of M4. The nearest railway station is Cardiff Central. The facilities for car parking at Cardiff airport are plenty. There are on and off car parking facilities available at Cardiff airport. The car park is securely monitored by CCTV and security patrols. You can transfer from the car park to the Terminal building of Cardiff Airport by the courtesy bus. Off airport car parks are cheaper than on airport parking facilities. Booking your car parking at Cardiff airport in advance allows you a discount of nearly 50%. 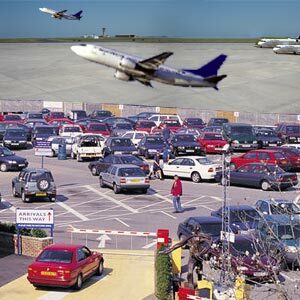 Short term and long term parking options are available at Cardiff airport car parks.